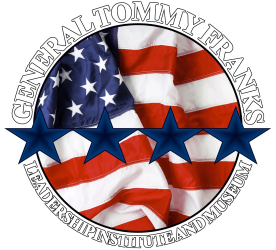 Volunteers are an active part of the mission of the General Tommy Franks Leadership Institute and Museum, providing invaluable resources through educational programs, daily operations of the building and collections and assisting with long-term goals. Volunteers may donate their time in a myriad of ways including assisting visitors, giving tours, assisting staff behind-the-scenes with exhibits, cataloging and caring for collections as well as helping to host and plan special events. If you would like to give your time, please call (580) 726-5900 or fill-out the form on this page and we will be in touch.